Buongiorno! 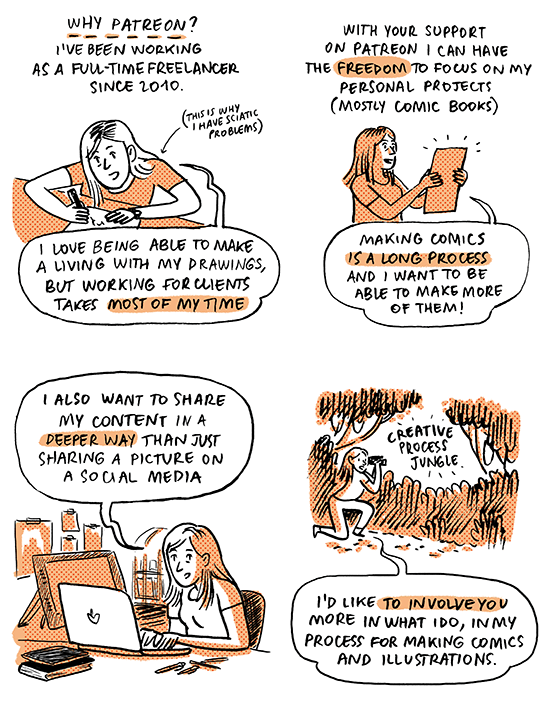 I’m Giulia Sagramola, cartoonist and illustrator from Italy, currently based in Barcelona. I’ve published two comic books in Italian: Bacio a cinque (Topipittori), Incendi Estivi (Bao Publishing). I'm also part of Teiera (self-publishing label created with Sarah Mazzetti and Cristina Spanò). 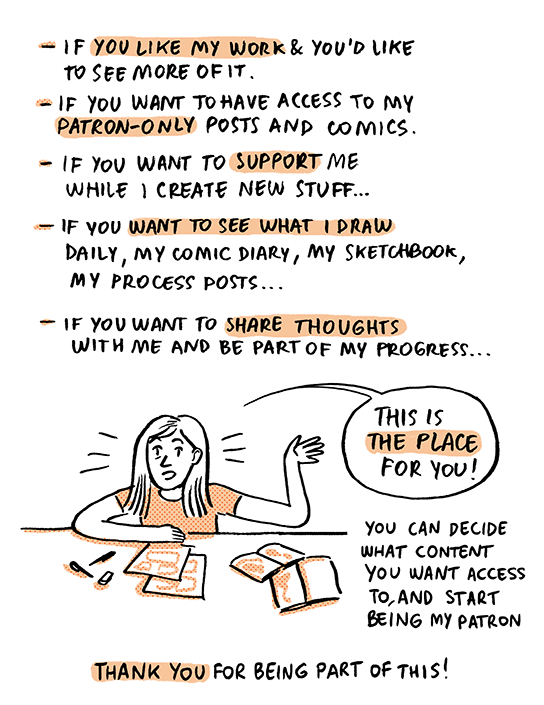 Patreon is the space where you can have access to my daily comic diary, my work in progress, my process posts and my visual research. For $1+ you get access to all the posts: you get access to my work in progress, sketches, process posts. I’ll regularly show you the inside view of what I do every day. For $2+ you also get access to my Comic Diary, it's the project I'm doing now and you'll get content every week. If you are not sure, but curious to give it a try, don’t worry: you can edit or cancel your pledge anytime you want. 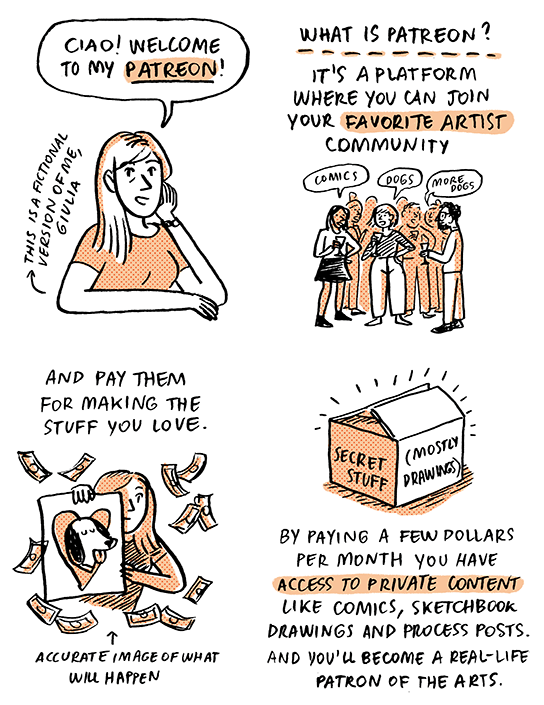 If you'd like something in particular for your pledges (published zines, prints, originals, private video tutorials, Q&A videos) feel free to share your thoughts with me! I really appreciate if you want to support my art, I’ll be very happy to share my process with you! Check out my work on Instagram, Facebook, Twitter and Tumblr. Access to my patron-only posts where I share my work in progress, sketches, process, 20% off in my online shop and know that you have taken part in supporting me create my personal projects! Access to my Comic Diary, around 2/3 pages per week, (sometimes more), access to my patron-only posts where I share my work in progress, sketches and process, 20% off in my online shop and, of course, my eternal gratitude! To celebrate this goal, I will make a patch for you as a special member of my team, probably it will be a dog related patch! I'll send it to every current contributor! Grazie mille (thanks a lot)!